Around 1830, Nags Head was growing in popularity as one of the most sought-after resort destinations on the east coast. Classic old Nags Head style architecture in the historical district, famous attractions such as Jockey's Ridge, and constant renewals such as the reconstructed Jennette's Pier and beach nourishment reflect the perfect balance of past and future in this famous Outer Banks town. 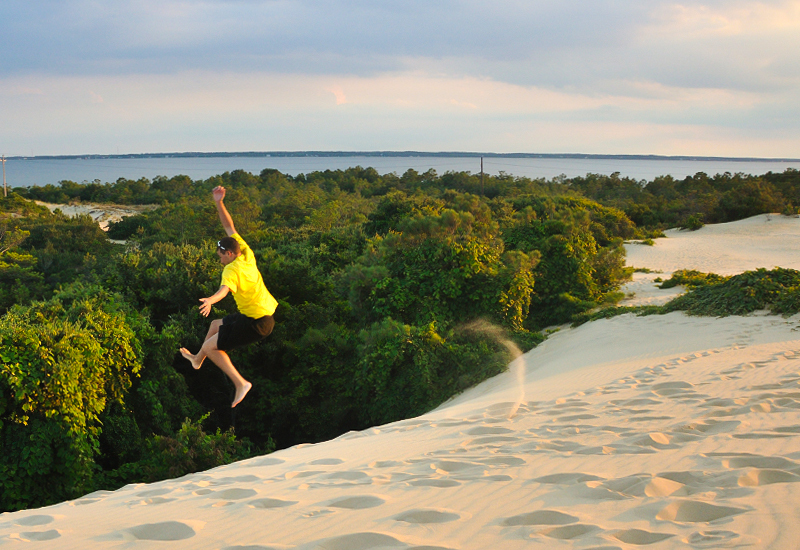 A must visit for those vacationing in Nags Head, Jocky's Ridge is the tallest sand dune system on the Outer Banks. The state park is more than the desert like dunes, with a healthy maritime forest, and Roanoke Sound. There's a visitor center and museum where visitors can learn about the geological and cultural history of the area. Be sure to bring water in the summer months as the heat can be amplified by the baron landscape and sand on the dunes can be hot. So bring shoes as well. You can walk the nature trails, fly kites, picnic, and even take hang-gliding lessons in the park. Playing on the sand dunes is a past time of kids and adults. It's almost like the world's biggest sand box. The park is open year round, except for Christmas Day, and the park is free to visit. The park is only open for daylight hours, and watching a sunset over Roanoke Sound is a favorite to do, especially during the summer to avoid the heat. We host many of our vacation rentals in Nags Head NC. Many of these fantastic rental homes are located within Nags Head communities you'll see below. Get more for your vacation dollars by choosing a home within these communities by having access to community pools, shuttle services, access to golfing, and more. Specializing in Nags Head and Duck NC Vacation rentals we take pride in our selection for our customers. With many affordable oceanfront and near ocean homes, we're sure we have the perfect vacation home for you and your family. Use the link below to view all of our Nags Head rentals and easily refine your search to fit your needs.